Where should I start my career in PM out of undergrad? How can a new graduate, without much product or technical experience, stand out when applying for a PM role? I have an interview tomorrow for a PM position. Any advice to really excel in the interview? Why the transition from design to product management? What are your thoughts on acing a PM job application and crafting your resume? I most recently helped build, launch and run a start-up as the director of Ops where I also served as the PM & I'm trying to balance the two in my current search. Side note, I have 15 years of experience building or turning around organizations along and am also a former management consultant. I have 4 years' experience as a software developer but wish to transition into PM. What are your suggestions on how to get started? I've started two start-ups and a lot of my PM experience is very unstructured - been forced to be a jack of all trades, but no formal training offered at more established companies. As someone who is looking to transition into a PM position - where do you start? I'm making a transition from content to project management. What are some of the best qualities of you've found in project managers you've enjoyed working with? What are your suggestions for someone like me, with a background in investment banking / private equity & venture capital to successfully transition into PM or a BizOps type of role? Have you seen many people make the transition from non-profit PM roles into for-profit roles? I don’t see many models for how to talk about my experience as a PM in a nonprofit when I interview at tech companies. How can I build a personal brand to get a foot into product management? Are there ways to display a PM projects for others to see? I know that age bias is a real thing, just wondering if you'd seen it in action within PM-land. I was also thinking about cultural fit, although I suppose that would depend a lot on the specific company? When reaching out to someone on LinkedIn, should my ask be more for informational interviewing purposes? I've done tons of this in the past, but as a senior-level person I wasn't sure if this method was still appropriate given how long I have been working for. I have 4 years' product & marketing manager experience in automotive. I just got my MBA from a top 10 B-school, engineering undergrad and have a few product side projects. But, I am finding it a challenge to get interview calls even after networking and reaching out. Any tips for me? What was the transition from design to product management like for you? What were the challenges? How do you build your product sense? Any daily practice? How does your cognitive science degree help you in your current role as PM? How do you balance data and intuition when making product decisions? What role does data play in making and justifying your decisions? What would you say was the most useful resource for you in your career that helped you grow as a PM? Any specific resource that stands out? What product management tools do you like the most? What is a good community and channel for Product Managers to get into for professional discussion? How has working as a Twitch product manager varied from working at other places or industries? What features/products are you specifically working on at Twitch and which technical skills did you find were most necessary for your role? What's your favorite part of being a Twitch senior product manager? What are some challenges you've met and how did you solve them? How do you think of customer oriented design? How do you and your team integrate monetization with design? 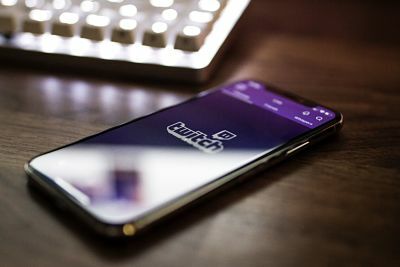 Who is your favorite Twitch streamer? 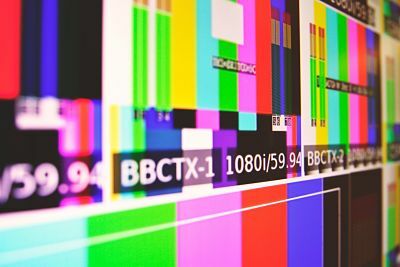 Why do you think many platform (tech-focused) companies create content, while content production companies (such as Disney) strive for a platform creation (e.g., Disney owns % of Hulu)? Before we go, do you have any final advice for aspiring product managers? What are your thoughts on acing a PM job application and crafting your resume? I most recently helped build, launch and run a start-up as the director of Ops where I also served as the PM & I’m trying to balance the two in my current search. Side note, I have 15 years of experience building or turning around organizations along and am also a former management consultant. I have 4 years’ experience as a software developer but wish to transition into PM. What are your suggestions on how to get started? I’ve started two start-ups and a lot of my PM experience is very unstructured – been forced to be a jack of all trades, but no formal training offered at more established companies. As someone who is looking to transition into a PM position – where do you start? I’m making a transition from content to project management. What are some of the best qualities of you’ve found in project managers you’ve enjoyed working with? I know that age bias is a real thing, just wondering if you’d seen it in action within PM-land. I was also thinking about cultural fit, although I suppose that would depend a lot on the specific company? When reaching out to someone on LinkedIn, should my ask be more for informational interviewing purposes? I’ve done tons of this in the past, but as a senior-level person I wasn’t sure if this method was still appropriate given how long I have been working for. I have 4 years’ product & marketing manager experience in automotive. I just got my MBA from a top 10 B-school, engineering undergrad and have a few product side projects. But, I am finding it a challenge to get interview calls even after networking and reaching out. Any tips for me? What’s your favorite part of being a Twitch senior product manager? What are some challenges you’ve met and how did you solve them? 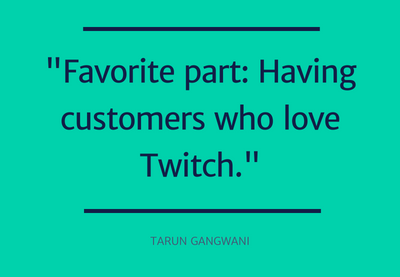 This week #AskMeAnything hosted Twitch senior product manager Tarun Gangwani. The Slack community was really eager to learn how (and why!) one transitions from design to PM. Tarun answered this question and many others on the right age to become a PM, the best thing about working at Twitch and the current blurring of lines between platform and content-provider companies. Tarun Gangwani is an award-winning product and design professional whose work has been used by millions of people around the world. With his background in cognitive science and design, Tarun has delivered user-centered solutions for start-ups and enterprise companies within a wide variety of industries that leverage cloud technologies to deliver innovative experiences. 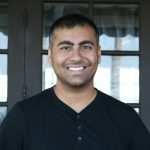 Tarun’s perspectives and work have been featured in major news publications, including the New York Times, CIO.com, Tech.Co and he’s been a part Forbes’ 30 under 30! As Twitch product manager, he helps developers build sustainable businesses on its live streaming platform. 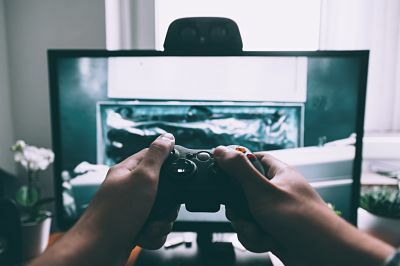 His team creates tools and resources that help people to build live apps on Twitch, enabling multi-player entertainment between creators and viewers. It’s hard to get a junior/entry-level PM role. I think your undergrad can help you get a first gig in a company, usually one that encourages undergrad hires – but it might not be a PM role directly. First, open up your job search to other roles to get your foot in the door. Then, after you get into the company, you may be able to leverage your current role into a PM role. For example, at IBM I started as a designer and then transitioned to OM (offering manager). It’s really hard to transition to PM out of school or between companies. It’s not impossible, but I find a less friction, more forward momentum path is to find a role that hires PMs and then proving yourself. Your résumé is a critical artifact before the interview. At Twitch, we quickly screen résumés to ensure they are at the minimum bar. Be sure to show real product experience over school work and if you have side projects to show, then do bring those up as well. If you aren’t a fit for the role based on years of experience (usually a high bar because PMs need to have experience in another role), then you may want to consider opening up your search to something closer to your training and then transitioning into PM. 1) Be authentic and honest. 2) Show breadth and depth in your examples/experiences. 3) Have questions about how they do product at the company, what tools they use, and their overall culture. 4) Show interest in the role before the company. 5) Be fun to hang out with and show your passion! I knew that I cared about why products and businesses work, how users navigate products, and how these products are developed. In design roles, you tend to mainly focus on the second bit. In a PM role, you really have to oscillate back and forth. Maybe it is some mild form of me having interest in a lot of things at the same time, but I like how PM challenges me in all aspects every day. Specifically with design, I found my strengths were more in thinking about the user journey, telling stories and thinking about strategy. At some point, I leave the details and focused discussions on the UI to the experts. I like having that level of interest, while still being able to think about the bigger picture from a business/organizational/strategy level. 1) Be sure to select the right experience that fits that role. Don’t add experience for the sake of beefing up the resume. 2) If you use an objective, be sure to explain why you want that role and why you’d fit at their company. 4) Find someone on LinkedIn on that team, reach out to them, understand their needs and internally sell yourself. 5) Reach out to the recruiter and make an impression. If you don’t know who that is, reach out to any recruiter at the company and get to know them…chances are they’ll connect you if you make a good impression. Try to take on more “PM”-related tasks and output more deliverables in that direction. Most of the time for PM, as I’ve mentioned in some other answers, requires selling yourself as being able to do the role. If you can talk about the business/design/development equally and navigate them both effectively, you look more like a PM candidate. In scrums, make decisions on trade-offs, argue for priority and make cases with data. During the development process, engage with designers and PMs on the decisions you are making, justifying/challenging assumptions made. When presentations on the progress are made, take the lead and practice articulating a product argument. 1) Start writing about your experience from a PM lens. Talk about what you’ve done to move the needle on the product side. Share experiences on Twitter, etc. to showcase your product prowess. 2) In your résumé, use whatever title combination that positions yourself for the role. As someone who worked at an early-stage start-up, you can kinda call yourself whatever you want at any given time… so use that diversification to hone in specifically what a hiring manager would look for. 3) Be ready for examples related to product in the interview. If you start talking about other aspects of your job, you will probably distract from your core reason of being there. 4) In terms of skill mastery, a few skills I know I use everyday: HTML/CSS, UI/UX, writing, public speaking, presentation, sales, marketing funnel analysis, writing requirements… I bet you have all of those skills! Now its’ about telling a story so someone can appreciate it all from a PM lens. The best qualities of project managers that I’ve appreciated are those that complement and help me do my job! 3) Connecting dots on similar projects and breaking down silos. At a start-up, you tend to do everything from everyday tasks to big thinking. You touch every aspect of the product. At an enterprise, you tend to focus on features, incremental wins, and how that relates to the high level strategy. Interesting question. I would start following some former P/E // VC folks on Twitter and digging into how they made that transition (or if they really did). Josh Elman comes to mind here. Like most other replies, the takeaway would be to find PM-specific tasks, emphasize that and find more opportunities to showcase that side of your brain. If you talk too much about your other experience, people will think you still want to be in that world. Surprising to hear that people feel like there is a disconnect when interviewing. Perhaps you are keying in too much on the non-profit specifics and need to zoom out a bit on how you do product at a company? Interview for the role you want, not the one you have. What I mean regarding a “digital presence” — Find out ways to set yourself up as a PM by walking the walk. Make observations on product on Twitter/LinkedIn. Write about PM-related topics. Answer PM-related questions on Quora (or at least, learn from others). Put yourself out there and announce you are a PM in everything you do. I think a design portfolio is a good artefact to gain inspiration from. I would think PMs probably talk about results/data/numbers a little more. They may also talk about how marketing/sales/strategy played a role in a product release. When I was interviewing, I created a short deck where each slide was a project and highlighted product related tasks I did to make the product a success. Totally a real thing and I totally empathize with you there. It might be worth taking that off the table by underselling yourself a bit and more doubling down on your core PM experience that fits the role. I have seen people get rejected due to it being a “cultural fit” issue, which I totally think is lame. At larger companies you won’t find this though, as people generally respect diverse opinions. We have a long way in the industry to be more inclusive of various backgrounds, so you may want to set yourself up as having the chance, and then making the decision obvious at interview time. Keep pushing! I totally get the frustration of someone not understanding how your experience applies to the role you are looking for. I do think it’s worth taking the effort of going back to basics and finding empathy with their job and meeting in the middle. Relationships get jobs, not applications! Keep pushing! In some ways, this is a numbers game, since you are competing with some high-quality people. Make sure your expectations match your reality and your experience. Networking won’t necessarily mean someone will give you a ring…you may need to meet people in person and start building relationships… selling yourself for the role only after a few dialogues. It might be a long game, but don’t lose hope! I made the case of being a PM (offering manager in IBM) by doing more strategic thinking about what or why we were building something, working closely with developers on prioritization and collaborating with several people across the company to break down silos and find opportunities. The biggest challenge was actually letting go of life as a designer and zooming out more…trusting others to do the details. Even today, I find I still wanna dig in and create mockups…but I am also learning to trust the system some more there and focus on creating the best conditions for us to deliver given tight resources/deadlines. Read a lot, especially from other PMs. @noah_weiss has had a lot of good threads recently. I also think reading biographies, listening to podcasts and other things to build the muscle of learning continuously helps. Writing about your work daily helps. I try to post something about my job everyday on Twitter. The engagement I get afterward definitely helps. At first I thought cogsci was a research-oriented degree, where you mainly wrote papers and did more work in that arena. Later in life, I’ve noticed that PM deals significantly with human psychology and how they interact with their world. Especially in developer tool world, devs use a product in concert with many other things and have to juggle your product (what is your pride and joy) with a thousand other things. So, understanding their environment and building deep empathy with how they think has made a huge difference on the UX I create and how I prioritize things we work on here and in past jobs. I ultimately think to navigate the weeds you should use prior art, what others have worked on, the styles within the company, and whatever else you can use in addition to data to making a quality decision. At Amazon, a lot of arguments are won with data…but a lot of discovery starts with thinking about a space and hearing from users what they need. I’m a JIRA guy… and I use Apple Notes a lot. Astro for email. Google Docs to collaborate. I try not to get too keyed on on the tools side, since it is more about the spaces in between tools that make life as a PM. Good question — depends on what kind of discussion and at what level. LinkedIn is good for peer-to-peer advice — I recommend building a network there, as groups mostly don’t return a lot of value. Reddit is great but has a high bar for content and questions have to be focused. Slacks like this Product School one are great as they are informal and you can have back-and-forth dialogue. In this regard, be sure to know exactly what you are looking for and what you want to get out of the conversation. I’ve also really enjoyed interacting with PMs directly on Twitter. There’s nothing better than a quality 1-1 dialogue to help you dive deep into what you want to discuss. Build your own community! Uniquely about Twitch is its culture is far different, mostly because the product itself has its own culture. IBM was too disjointed to really have a singular culture per se. Startup is super heavy on what the founders what to dictate. Here at Twitch, the company has its own culture and the product influences that culture too. I’m working on the dev.twitch.tv site, our docs/API reference and the console where developers work. Tech skills required were a knowledge of how cloud platforms work, how developers work and how websites are built. Favorite part: Having customers who love Twitch. It makes life as a PM enjoyable, fun and challenging. On the challenges, you have to balance the needs of several voraciously enthusiastic people vs. the future of the company and where we are headed with developer experience. We have so many short-term problems to solve, but also we have big ideas to shoot for in the future. I find myself moving back and forth between those everyday. So that’s really challenging. 1) User-centered design is an almost always sure-fired way to gather data to understand where your issues are. If people love your product, you can learn from them on how to acquire more of them. 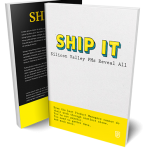 If people hate your product, then it indicates you need to start there. 2) We used the monetization product native to Twitch, bits, to provide a revenue stream to developers, users and the broadcasters. We always try to find ways to create win-win-win opportunities in the ecosystem. @trihex, @drdisrespectlive, @thehungerservice, @nikatine, @bluelava and @twitchdev! I think every video-based platform eventually evolves into a media company, but Twitch has somewhat of an advantage in that we understood influencer marketing/promotion way earlier than most. We understood that people come for the fans and content and we need to do a better job keeping eyeballs on the people we already have. I do think forward integrating into content creation is required. On Twitch, we struck deals with Blizzard and others to spawn new tournaments and similar. That’s our first toe in the water. We also did a curation deal with the BBC to show Doctor Who. The reason is to find adjacent content to the core content. It keeps eyeballs around and helps us sell ads and, therefore find more money for creators. The latter part of your question comes to core competencies and the muscle of the org. Tech platforms have no idea about content but know it’s what brings users. Media companies know what sells but don’t really get digital yet. I’m bullish on Amazon/Netflix/Facebook because they are great at both and have the users. We’ll see though. 1) Apply for the role you want, not the role you have. Don’t lean too much on experience that would be irrelevant to the role you are seeking. 2) Craft your résumé, cover letter and positioning for that role and company. 3) Show passion, integrity and experience to people looking to hire you. 4) Find product management-related opportunities within the current company you are at — it makes the transition a lot easier.